In “Mantra” I redefine my native Nepali alphabet through the alphabet of hip-hop culture by meshing it with the Boston graffiti scene. I write the word “Imagine” in Nepali, a word that is close to my heart as it is my mother’s name, and use the colors yellow and red, which are auspicious in Nepali culture. I aim to create thoughtful yet irreverent pieces, marrying the beauty of an elegant script with the droll text I often incorporate into my canvases. My worlds come together as I bring my two languages and cultures together. 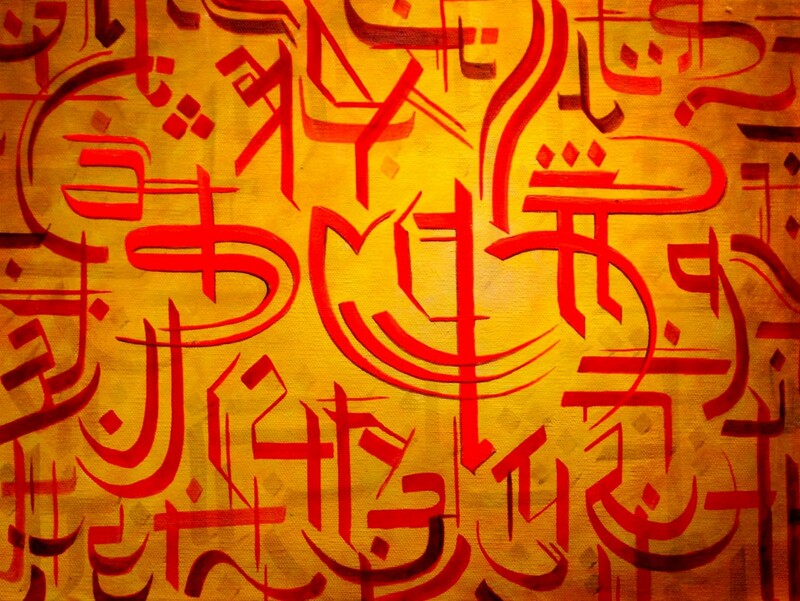 This painting is a mantra to my family, which I’ve come to appreciate in the same way I’ve learned to appreciate the aesthetics of the Nepali alphabet after being away from home for many years. 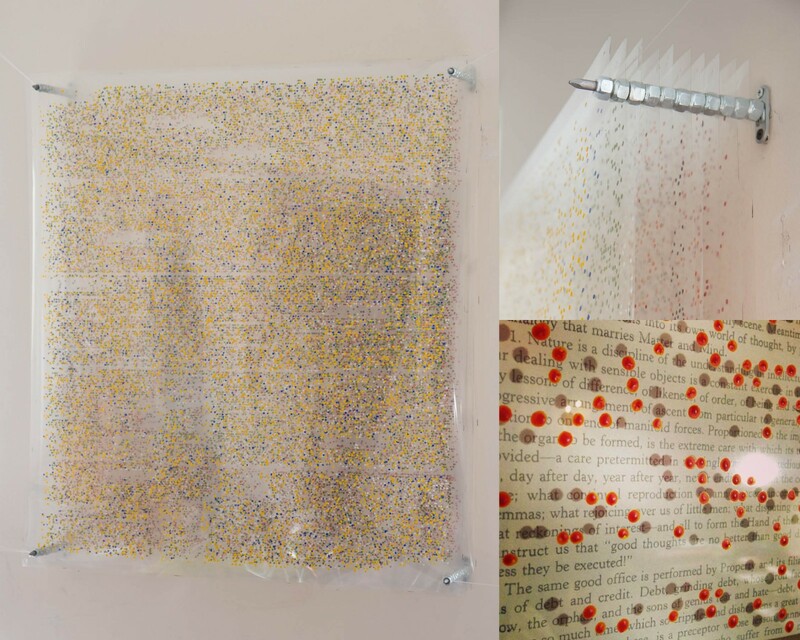 "Untitled (Emerson's Nature)" is the first in a series of color translation material studies—translating selected texts into colored dots, letter by letter, using grapheme-color synaesthesia as inspiration. The translated text for this artwork is Ralph Waldo Emerson's essay "Nature" published 1836. Artwork from this series of color translation studies places emphasis on mixing/matching color and material interaction with light. Project created for the poet Czesław Miłosz Year. The poem "Clouds" was translated by me in top 20 languages of the world, using the tool 'Google Translator'. Then I translated them from the selected languages back into Polish. What came back to me was stunning. The whole meaning of the poem was changed. Each and every translation was a completely new piece of mistakes and bizzare meanings. I was fired from my job as a charter school teacher in 2011 -- not fired for misconduct, or insubordination -- but for organizing a union among my colleagues. My termination was illegal, and I gave a deposition to the attorney assigned to represent me on behalf of my union. Soon after my suit was settled, I received a box from the school, full of my belongings - one of which was this roll of Scotch tape. I thought a lot about each object that came back to me in the box, and in this piece I link the staffs’ collective action (‘sticking together’) with our demands for more administrative transparency (clear tape). I imagine this roll of tape back in a teacher’s desk: the teacher pulls the tape out of its container - reads, knows, understands exactly what our experience was within the same school walls, and then uses its contents to repair further. As an homage to Raymond Queneau, this exercise takes the form of the children's game 'Chinese Whispers', by translating the same text from an old English book of manners through multiple languages. 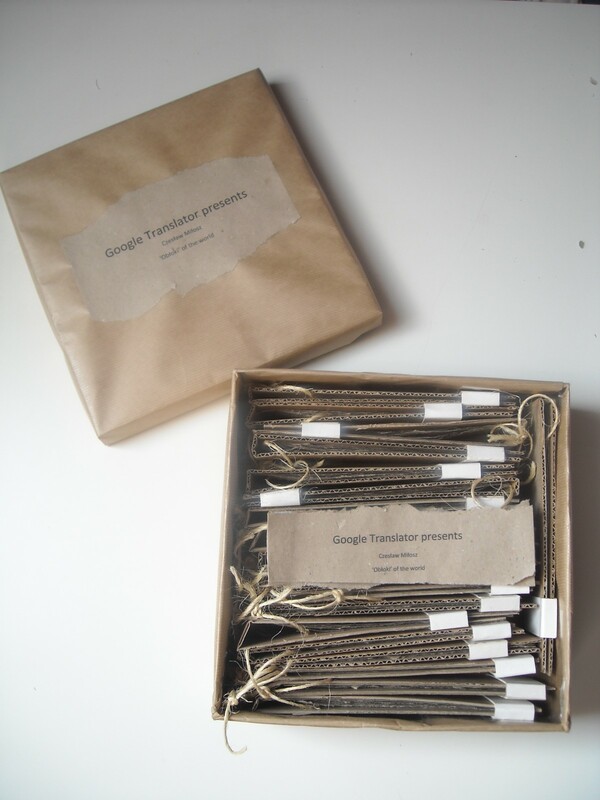 Instead of human ear-to-ear retelling, the content is communicated through the widely spread 'Google Translate' service. 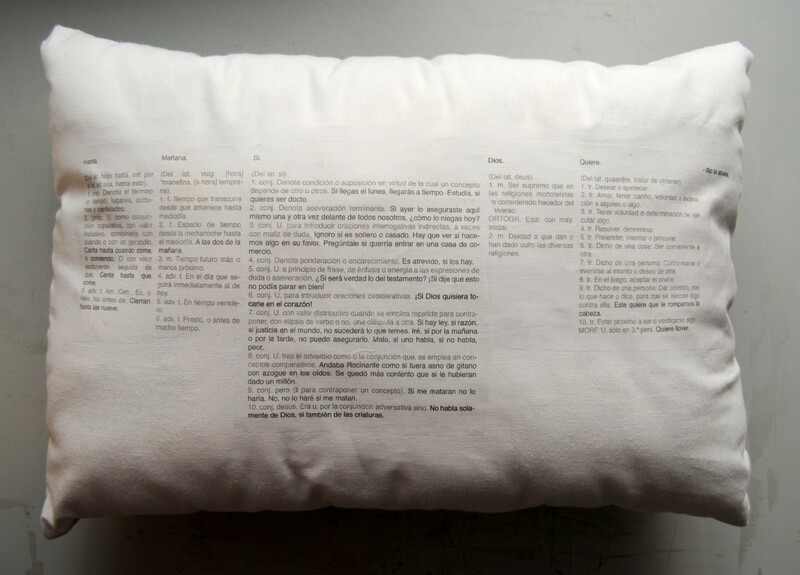 The resulting form alludes to the book as a codex, set of rules, institutions. Through showing the gradual process of losing meaning, the work emphasizes the role of context, which can render social rules of one age completely absurd to another. Third in a series of books united by interleaving their pages. Exploring the book as an analogue for the body (and written text as a representation of spoken language) I connected these forms to evoke the relationships that can take place between two bodies—physically, verbally, psychically, etc. 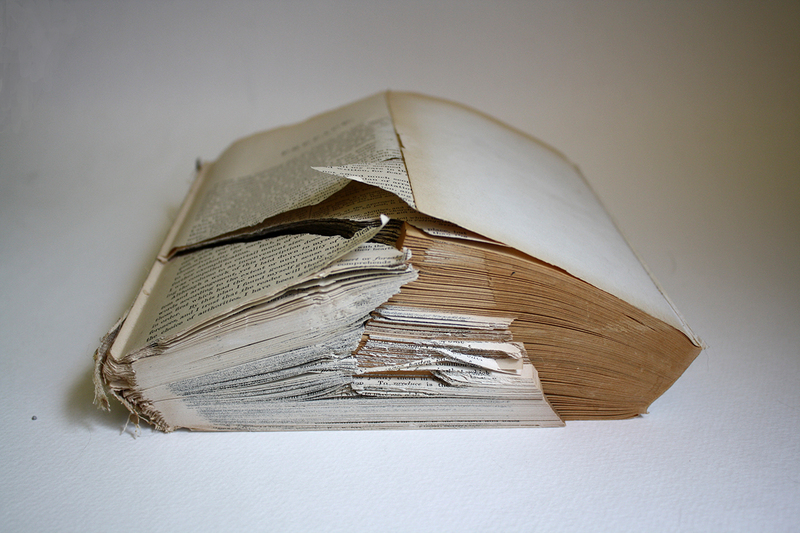 Once the pages of each pair were interleaved, I cropped the merged form using a book guillotine. This pressure helped to highlight the points of strength and fragility that formed in the merger of the two books/bodies. Collaboration between Tihana Gržanić (Croatia) and Magda Wolnicka (Poland). As printmakers, we are interested in the basic issues of communication. Books include and connect different techniques and ways of work. 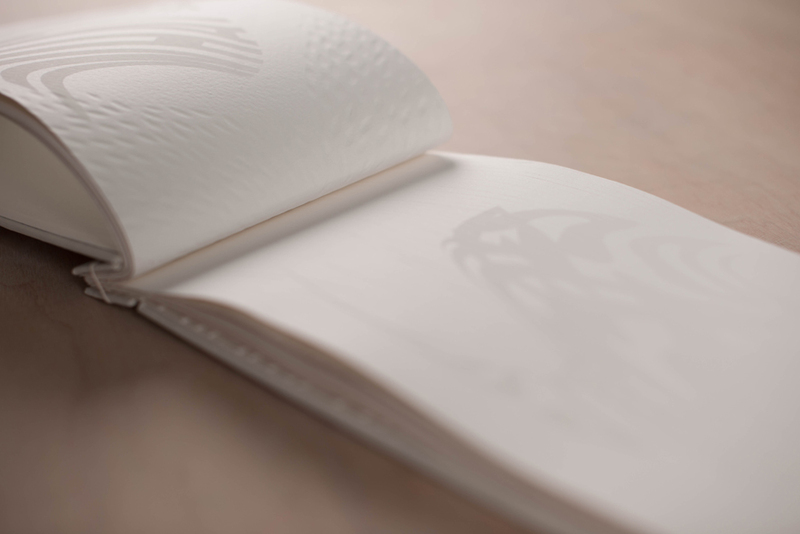 Using white colour for serigraphy, and blind print, we create delicate objects, sensitive to light. Almost invisible, intimate things, material whispers. Imagine/invented language between two close people, based on well known form but transformed into an abstract, visual story. The Centipedes is a network of small prints with short stories secretly inserted into the books of libraries and bookstores in and outside the United States. The stories, initially written in Korean by Yun Jin Woo, are loosely connected to each other by some mention of centipedes alluding to Korean folktales in which centipedes are usually depicted as the villain harassing villagers with the ability to morph their appearances at will. In this project, however, such ability of centipedes provides ambiguity in that other characters in the narratives can reside and be ‘incubated’ before appearing in different bodies. 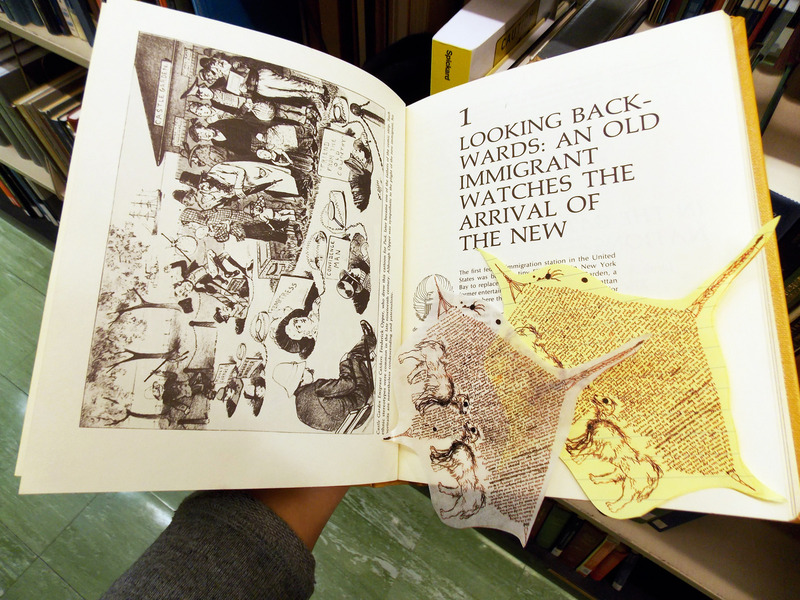 Similar to how insects breed in unexpected places, these strange prints infiltrate the circulation systems of the libraries and bookstores to migrate through others’ trajectories and unforeseen discoveries. "Ideas are so folded in the soul, that sometimes it's impossible to develop them." Gilles Deleuze, The Fold. This piece uses language as an abstract pattern. When I was a kid, I used to carry a cotton handkerchief in my pocket. As an adult, I see a handkerchiefs as a resonant object that catches the emotions we wipe from our faces. Additionally, kerchiefs are a somewhat antiquated accessory. I became interested in this combination of emotion and permanence in our ephemeral present. 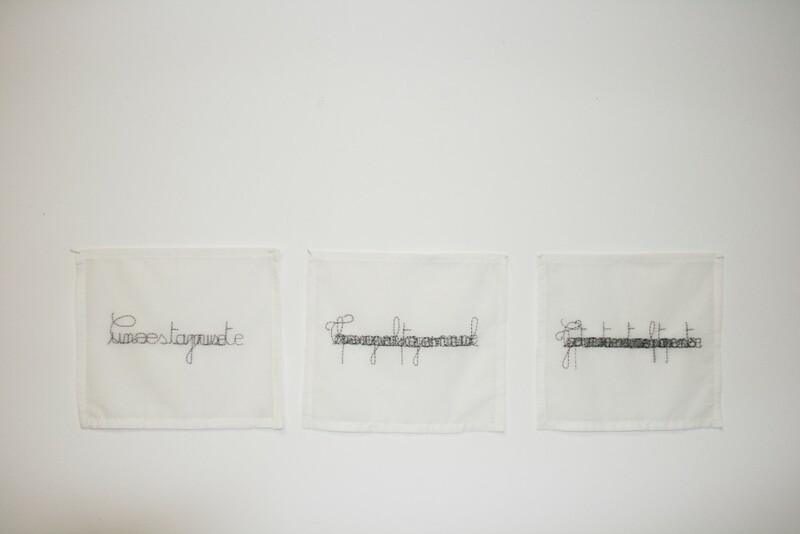 In this piece, I have sewn lies over top of each other on a cotton handkerchief. I wanted to create a ritual to explore knots of emotion and their transformation into objects of confusion, and how questions of truth are carried and radiated through our lives. 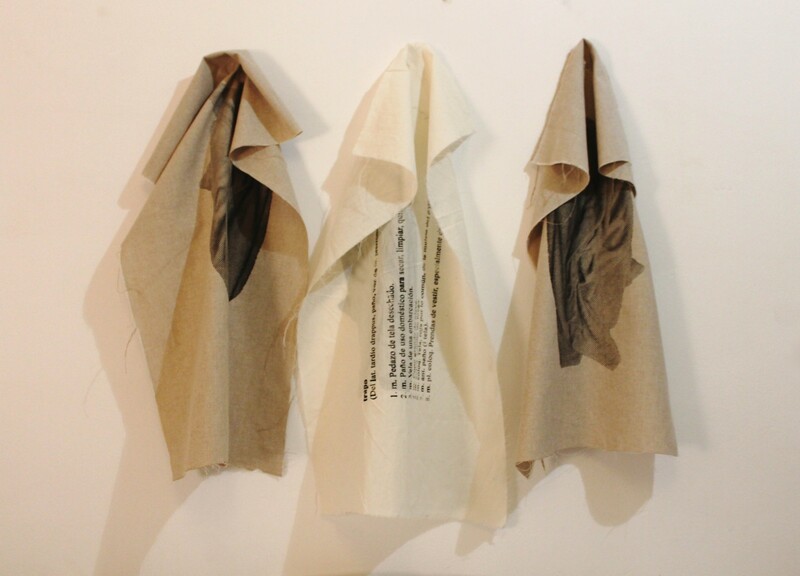 These handkerchiefs represent both the cyclic nature of fabrication and the physical act of carrying our words and actions that prevent self reflection and impede us. Esta obra forma parte de una serie de pequeñas almohadas en las cuales recojo distintas frases que mencionan mis familiares cuando se van a dormir. Almohadas para pensar antes de dormir. Se trata de una reflexión acerca de las frases hechas que usamos sin cuestionarnos muy bien el porqué, su verdadero significado, y cómo estas reflejan y condicionan nuestras relaciones con lxs demás y con nuestro contexto. El lenguaje como constructor de la identidad individual y política. Bajo cada una de las palabras que configuran estas oraciones, encontramos las definiciones que la Real Academia Española da a cada una de ellas. La RAE, institución que garantiza el 'correcto' uso del lenguaje español por medio de normas, que nos habla y establece los límites de nuestra la 'realidad' como hispanohablantes. * * * This piece is part of a series of small pillows on which I have collected phrases that my family members mention when they go to bed. Pillows of thought before sleeping. It consists of a reflection on the phrases that we use without questioning their real significance and how these reflect and condition our relations with others and with our context. 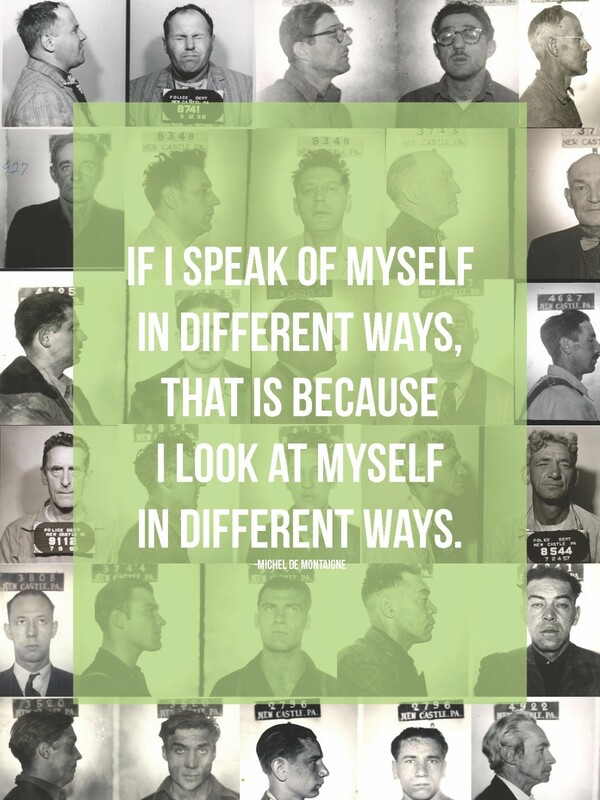 Language as a creator of individual identity and politics. Under each of the words that make up these phrases are the definitions that the Royal Spanish Academy gives to each of them. The RSA, the institution that guarantees the ‘correct’ use of the Spanish language through these rules, does not speak of or establish the limits of our ‘reality’ as Spanish-speakers. 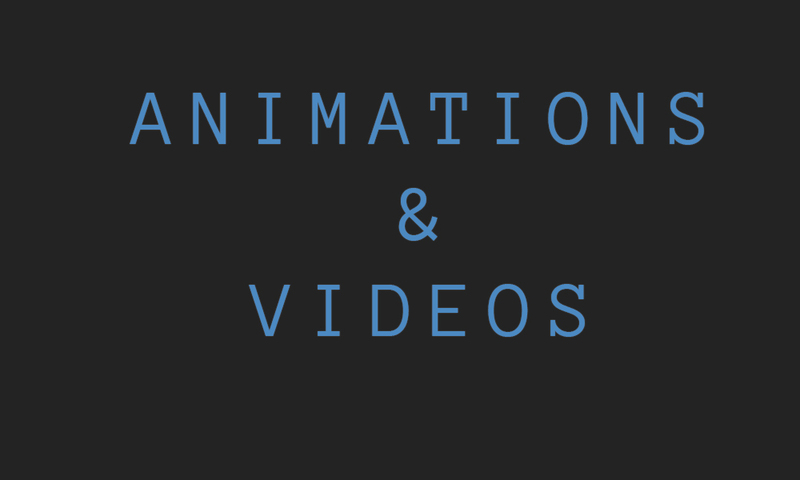 ◯ is a supercut of all round counters (enclosed, negative space) found in Unicode typefaces. ◯ presents these counters at 60pts and in Unicode order. The text begins with Basic Latin (0025), contains findings in the Private Use Area, and ends in the Variation Sectors Supp. Section (1F773). 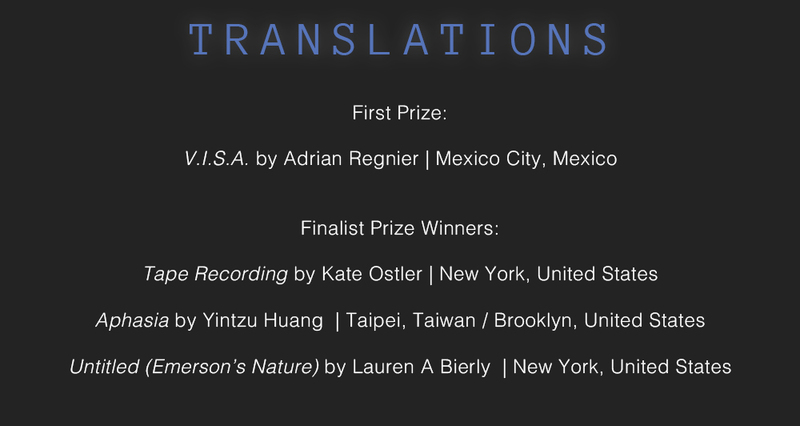 The project began as a return to one of Concrete Poetry's originary questions: How to write an international poetry? 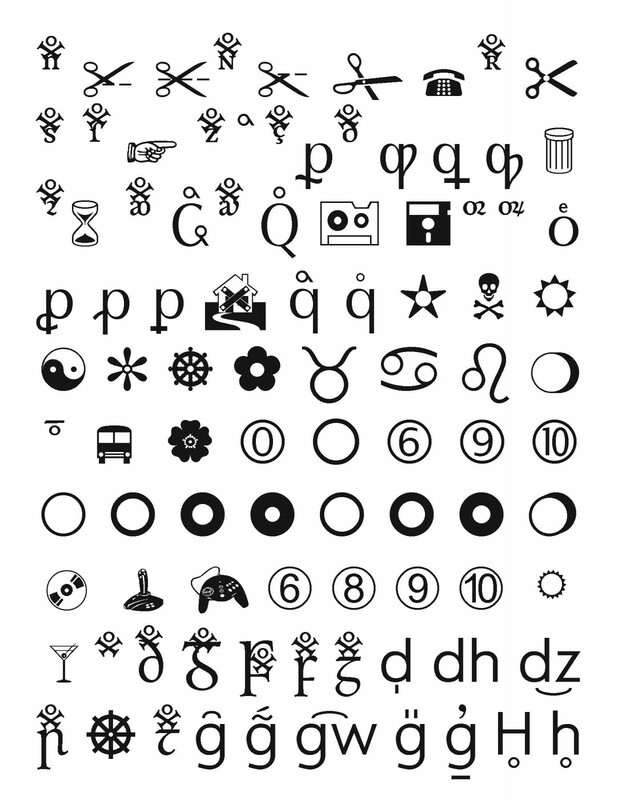 With today's Unicode, the writers' and text artists' palate is far wider than when the Concrete Poets began their investigations in the 1950s. And, composing years later in the hyper-connected digital age, our conception of "the international" has grown. ◯ exceeds the efforts the Concrete Poets by offering the reader/looker a visual presentation of sequential, standardized glyphs in need of no translation -- whatever the reader's language background, unique readings, misreadings and visions arise. "Marquees" is a series of silver-gelatin prints created from screenshots taken within Google Street View, specifically from church signs found throughout middle America. The series presents the language of what is often referred to as "the heart of America,” but taken out of context and manipulated to the point of near-abstraction. 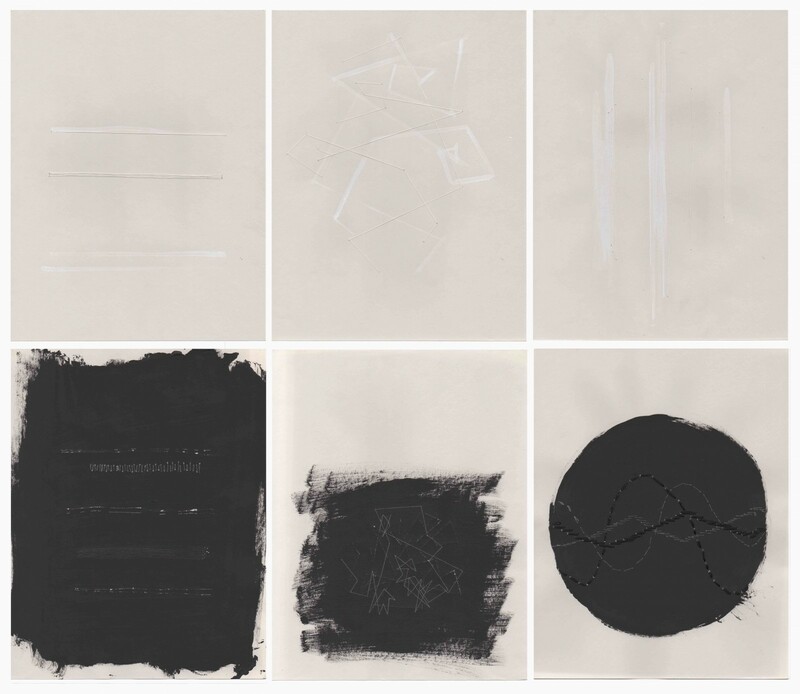 The end results are camera-less black and white prints created from an ephemeral and ever-changing digital landscape. How do we read a language we don’t know? My first encounters with Cyrillic, devoid of linguistic meaning, were pictorial and bold. Now I am bilingual. But how do non-Russian speakers “read” it? 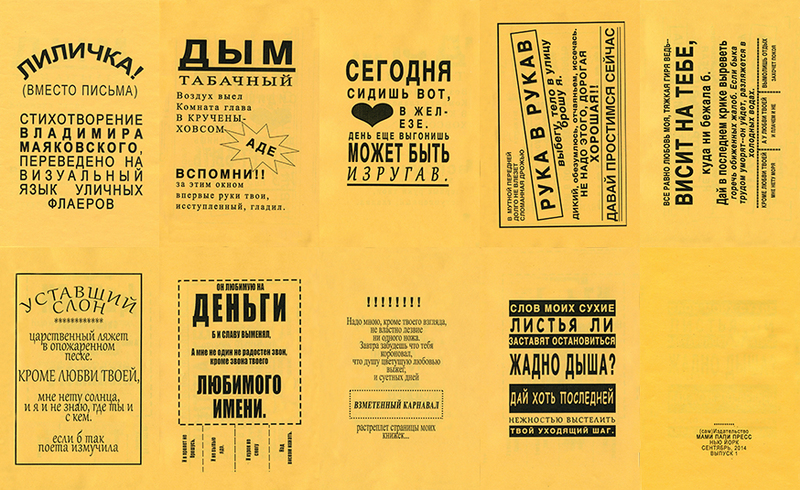 To explore the communicative powers of form, I translated Lilichka, a poem by Vladimir Mayakovsky, into the visual language of street flyers. Speaking through typeface, layout and exclamation marks, flyers are a cheap, effective way of conveying content to a wide audience. With this samizdat I invite readers to explore a collision of form and content and to puzzle out the literary gem hidden within. This work is a meditation on how the photographic image has been used, manipulated, transformed, and adapted to fit a series of heterogeneous social structures, and what is left of the photograph after it has passed through these various forms of representation and truth. 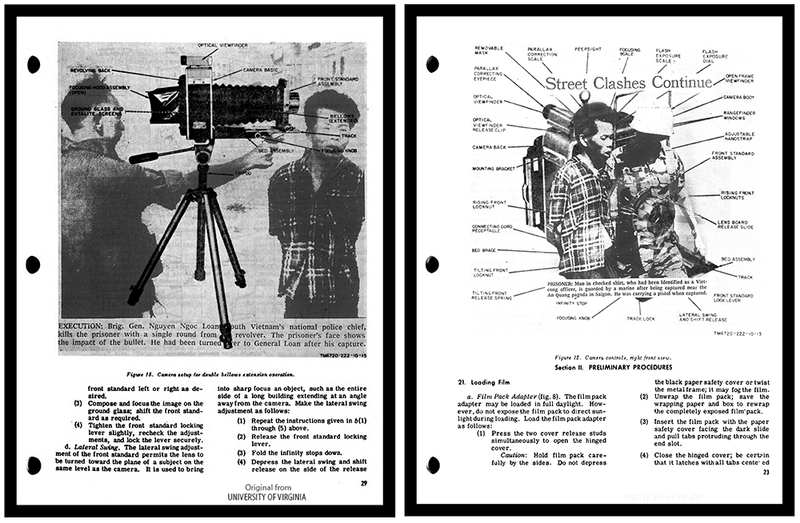 The work itself is a gelatin silver print created using a digital negative which was produced in Photoshop using PDFs of government manuals on camera operations and a scan of a microfilm of the New York Times from February 2,1968. By forcing all of these mediums and systems of photography into one traditional silver print the complexity and uncertainty of the photographic image can be brought to light. Everything is the truth is an English/Marathi artist book containing 24 crowd-sourced truths. 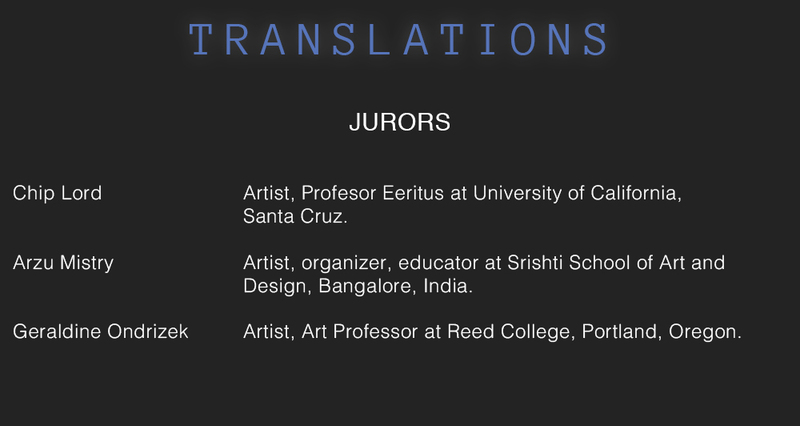 A large group of Mumbai residents offered these often contradictory truths as part of the interactive, bilingual performance "Certifying the Truth", which took place in Mumbai, India in February 2013. Over the course of the 3-day performance I collected over 100 versions of these "truths", and through an editorial process chose 24 examples for this handmade artists book. Rather than a bound format, this box holds 24 loose cards with each "truth" in Marathi on one side, English on the other. 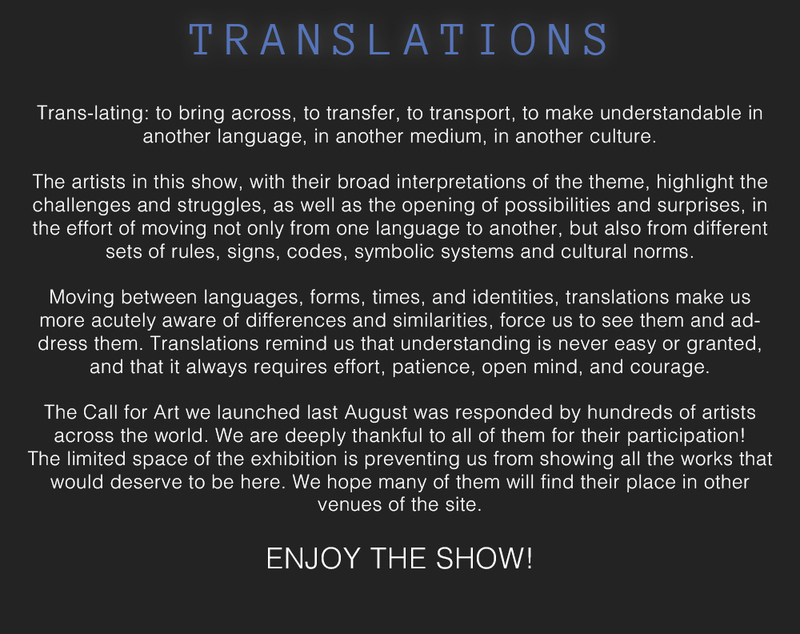 The non-hierarchical format allows viewers to freely read either languages rearrange the "truths", or single out one "truth" as particularly compelling. The book’s conceptual form honors multiple authors, languages, and points of view simultaneously. Melanie Klein, the British psychoanalyst, believed that the first major act of translation for all human kind is when we learn to talk as a young child and according to her the trigger for this act is nothing but loss! In a certain age, when the child realizes her own identity, separated from her mother, she falls into a depressive period caused by the feeling of loss and experiencing alienation and absence. During this depression she learns to cope with this loss by replacing the image of mother with a voice, by naming her. She also learns to translate her own needs to sound and words. In fact the incident of losing the joint identity of self and of the mother leans her toward the act of translation and also representation of a new identity. "The Representation" investigates a similar relationship between loss and identity by translating different mediums –such as text, book, photographs and the body of artist itself, into each other. With this work I explore the relocation of meaning from within the art object to the contingencies of its context and implications. By juxtaposition of these different mediums I engage the space as a new context for representation of identity in my work. This piece is an embodiment of my experience with micro-level discipline and power. It is made from a great deal of used adhesive tapes collected since my middle school in China. The tiniest misbehaviours, such as sloppy writing, resulted in humiliation for not meeting expected standards. 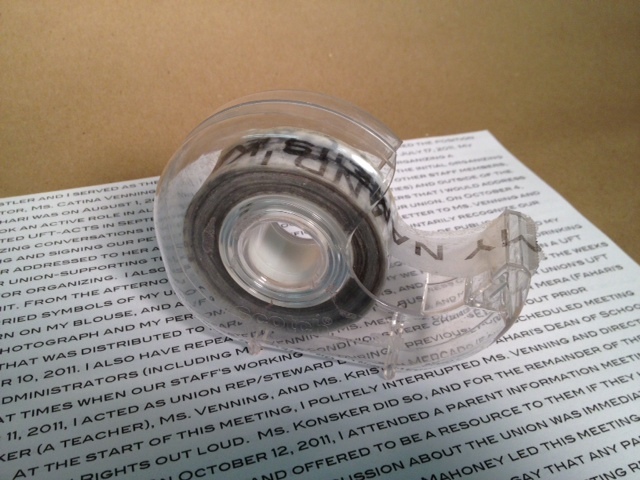 Adhesive tape became a powerful correction tool helping avoid blame and punishment from teachers. Originally, used adhesive tape was treated as trash. But out of context, the tape represents something different: the history and manifestation of discipline. Entendiendo el arte como la traducción de una idea, como un lenguaje en sí mismo, Carmín Alizarina nos presenta – que no representa- ‘Idea de trapo’. Su propósito inicial no es mostrar una imagen mediante la reinterpretación de la misma, sino ofrecer una visión lo más objetiva posible de una realidad. El medio juega un papel fundamental en la obra ya que aglutina tres lenguajes diferentes (la fotografía, la definición y el ente real) en una misma pieza de arte. Understanding art as the translation of an idea, as a language in and of itself, Carmín Alizarina presents to us - which does not represent - “Idea of cloth”. Her main objective is not to show an image through a reinterpretation of the image itself, but rather to offer the most objective view possible of reality. The medium plays a key role in the piece because it combines three different languages (photography, the definition, and the actual object) in the same piece of art. The plastic black bag is a vital merchandise tool in the stores and markets in Egypt. It is used in the pharmacies and liquor stores to hide the products. The target is to hide the purchased items from the passersby. This phenomenon actually provokes their sense of curiosity; people want to know what is inside the bag. Whether the merchandise was a personal belonging, underwear or even fruit, Egyptians have gotten used to playing a guessing game of what is inside the bag. I have gathered a number of items that people usually buy and placed in the plastic bags. However, I added some extra objects that are unpredictable to that specific social setup. My target is to observe and document people’s reactions towards what they find. 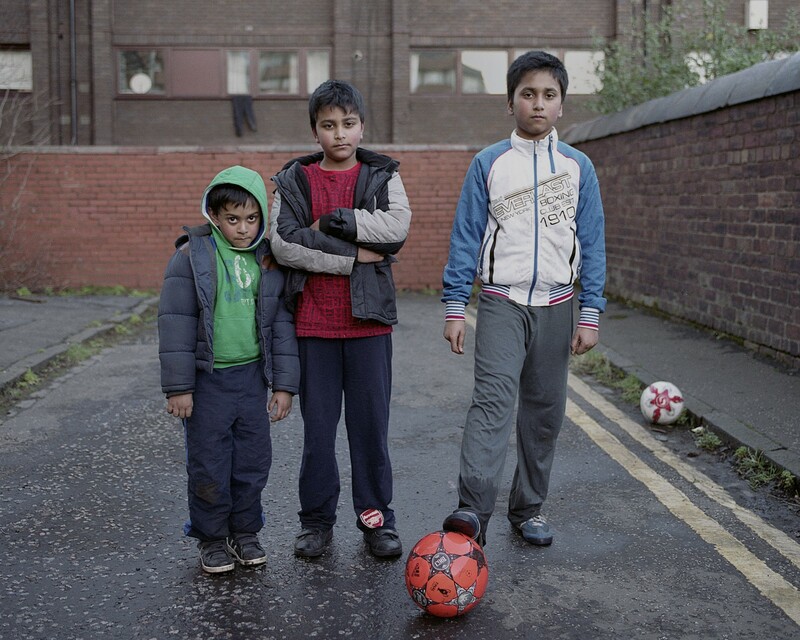 This image is taken from the series Gorgie which is located in a part of Edinburgh, Scotland. This area is multicultural and densely populated, here i relied on my knowledge of football to interact with the young boys whom did not speak English. Through our connected knowledge of football and sport we managed to communicate to each other, here we shared favourite tricks and formed a connection. This resulting group portrait shows the Gorgie Boys post football translation. My art practice is informed by reverse ethnography, explores themes from my own personal biography, and is explicitly political. It utilizes my personal experience as a lens onto the persistent effects of social institutions and cultural practices on the individual. More than 19 years ago, I made the journey north from Mexico to the United States. 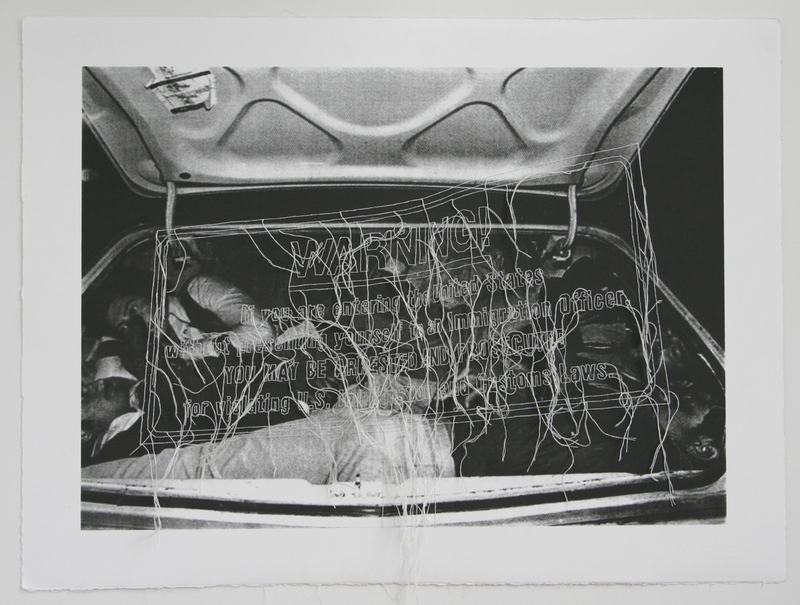 In many respects, my experience mirrors the stories of many immigrants, This is a silkscreen of a found image of four men caught trying to cross the U.S/Mexico border in the trunk of a car. The silkscreen is over imposed by a hand-embroider image of a road sign that warns immigrants crossing the border. This is one of the first pieces where I incorporated embroidery as a drawing element. This element seemed appropriate to make the piece more abstract and sculptural. One of the most prominent themes reoccurring in my work deal with immigration, as I am interested in the relationship between this country and those labeled “illegal"/immigrants. The television is perhaps the greatest tool of translation since the written word. The television shrinks concepts, events, characters, politics, all of life into images. But it not only shrinks things into flickering pictures - it has altered the way in which we view these images. We are passive receivers of visual information. Sights that would previously cause exclamations of wonder, shouted questions, things that would previously cause alarm, have been softened somewhat by a concentration of visual experiences that has built itself into modern daily life. 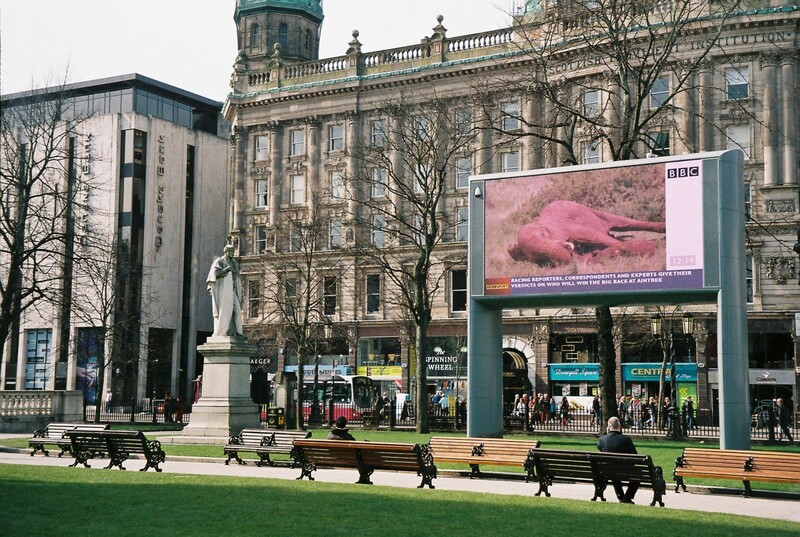 Here a dead baby elephant is condensed, transported, translated - into a screen in the centre of Belfast. And two strangers sit to see it. While reading Michel de Montaigne I felt more inspired, connected, and yet separated from humanity than ever. Going to school and majoring in Graphic Design, while minoring in English, I have started to find a connection between the two mediums. Through my work I want to visually show how de Montaigne's words can transcend not only different forms and media, but also the mindsets of different generations. ان الفرد في حالة صراع دائم مع المحيط نظراً لتداخل أنظمة وثقافات ونزاعات تقديم إمكانية للوحة بأنها الحدث الذي يتم إنشاؤه مشتركة بين الأفراد الذين يجدون أنفسهم التقيا معا عن طريق الصدفة. بنفس التاريخ او بتاريخين منفصلين او بجرافيتين منفصلتين بسبب النزاعات والحروب وحدود التمييز يحق لكل شخص ان يكبر بين الرموز الثقافية الأصيلة التي تأتي من مجموعة متنوعة من المصادر المختلفة التي تشمل: الدين والدولة من الأصول والمدارس و الأسرة، والأطعمة، والرقص والموسيقى والفن والأدب والقيم الأسرة والتصاميم الملابس، والأغاني، فهو القيمة والميراث الحقيقة للأفراد في مجتمعاتهم ان العمل يركز على تنفس الغة الصعبة للحياة في الواقع وتمثلها في المعنى الواقعي . لحركة جواز السفر خارج الإطار الزجاجي للوحة ان المرأة تقدم بشاعرية لهذه المعرفة. ،.وانا أجسد حالة واقعية لزوج وزوجة من فلسطين سحبت ودمرت منهم الوثائق الثبوتية وتم فصلهم الزوج مبعد خارج حدود الوطن والزوجة لا تستطيع السفر لأنه وثائقها مؤقتة ومحدودة الصلاحيات . My work discusses experiences of the past and future, and how we live in a constant dialectic in the light of wars and conflicts and the struggles of cultures. A drawing or a painting can be made into an essential cultural element of heritage through the use of authentic symbols. Elements such as hair, horses, embroidery, and women are organized to show their importance in bringing about this experience. The experience also helps us understand the gap in the Arab Palestinian identity, and how the individual is separated, dispersed and isolated from the social fabric. The individual is in permanent conflict with his or her surroundings. I depict the process of translating myself to a new region as a diagram moving right to left, or east to west, with Detroit area locales gradually (and sometimes harshly) being replaced with those of Portland. My life experiences form a personal grammar that develops as it moves from place to place over time. As I establish an identity in my new home, I shift between past and present experience. To achieve balance, I must leverage the past and use it to inform—not dictate—my path going forward. The Inverted Square is a temporary installation that explores the distribution of space and architecture around a public square in Barcelona’s Gracia Neighborhood. At the intersection of sculpture and street furniture, the project is designed to encourage people to be more attentive to the urban environment they occupy. The centerpiece is a geometric structure consisting of a platform and several modules representing an inverted topology of a specific public square and the buildings facing it. It represents the empty space “impressed” into the urban fabric by the square. 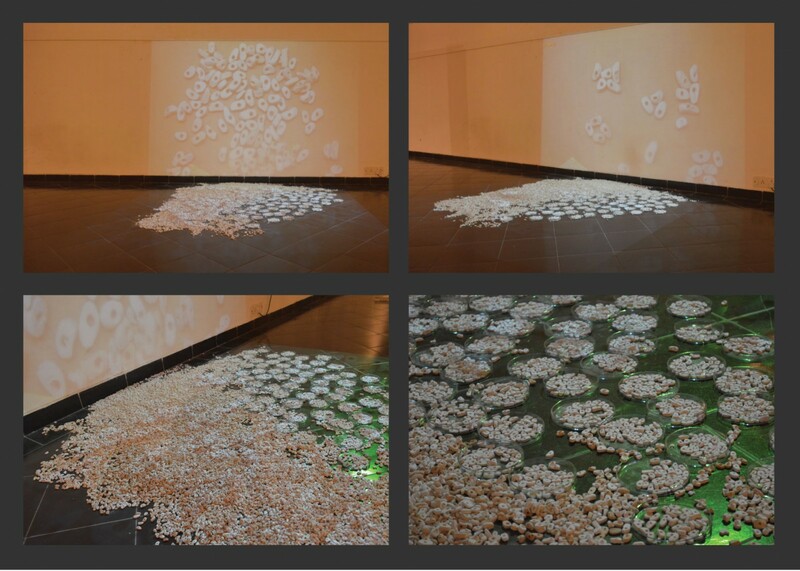 ‘Dynamo’ is a 3D representation of sonic waves from the busy streets of Varanasi in India. A sound track was taken from the streets of Varanasi and manipulated in a digital audio editor to create an image of the audio wave. This image was the genesis for the tangible aluminum sculpture. ‘Dynamo’ is a translation of the sound to physical form. What was ephemeral is becomes tangible and timeless. 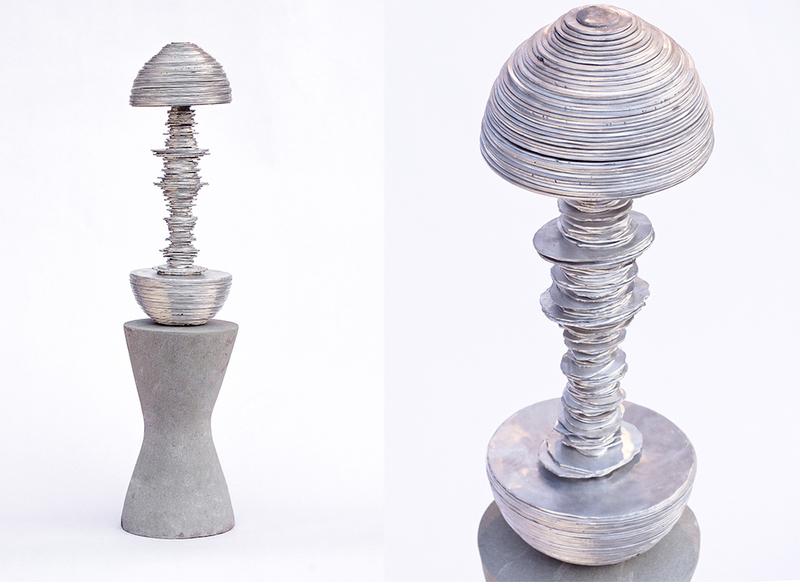 The aluminum sculpture is held on a sandstone plinth. To create this work, I walked through the streets of Philadelphia with a dust pan and swept up and broken glass that I found. After ritualistically cleansing and purifying every shard of glass, I fused the glass back together in a kiln, thus transforming each street incident into an orb-like halo. The resulting wall-pieces transcend their previous negative connotations within urban society through the use of light and simple formal variations within the found glass. A human cell understands your body and helps without asking. It multiplies itself to fill gaps, and supports all humans regardless of cultural and language barriers. 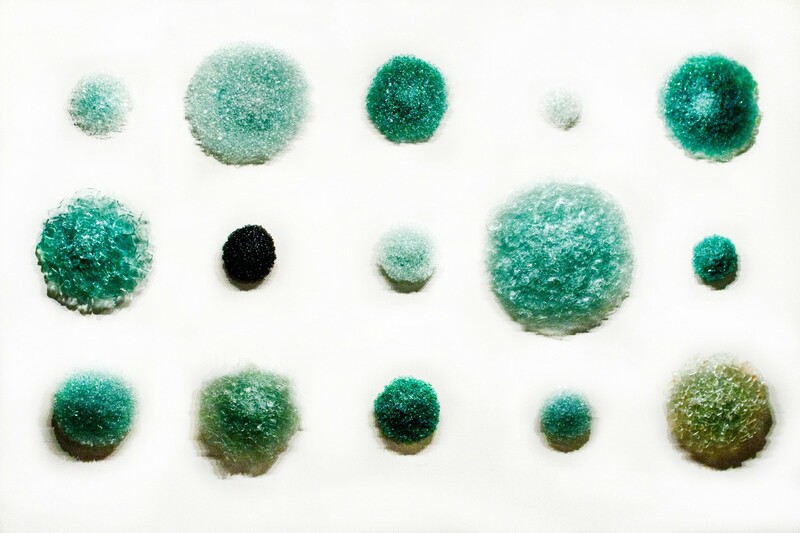 In this work human cells (ceramic beads) are placed in Petri dishes on the ground. A looping stop motion video is projected on the wall and over the beads to prompt the audience to try to follow the beads. The video shows beads moving over my stomach and in and out of my navel, depicting the movement of our cells and how they react to various situations or illnesses. Human cells provide a medium/platform for every living thing we know, and inspiration to bridge the gaps between cultures as a common language between all human beings. "The Kettle" is a super-short animation made by collaging and drawing over the printed-out frames from a sequence of live action footage. The aim of the film was to reproduce the elusive effects of peripheral vision--the ways in which our eyes and minds reduce our surroundings to simpler patterns, color swaths and momentary associations at the boundaries of our awareness. Every time we access a memory, our brain overwrites it while recalling it. My experiences become the lens through which I see my memories, layering them with new memories, but also erasing and modifying the original experience. As I moved recently to Maine from Southern Maryland, I have ben comparing their landscapes. Both are coastal areas, but the landscapes are very different. As I think about them however, elements from one cross over into the memory of the other, and they become similar. When you save a JPEG image, the file recompresses as it tries to find places where it can combine colors to save space. My memories are not so different from these JPEGs, changing over time. This short animated film is based on a poem of the same name by deaf poet Raymond Luczak. Both the film and the original poem tell the poet’s own story of frustration and resilience: the struggle of a deaf gay man to find love in the hearing community. Without any spoken dialogue, the film's only use of language is in American Sign Language, left untranslated. In the medium of animation, the narrative of the poem is overpowered by the grittiness of the film's texture. Different media (such as paint, digital animation, and tea leaves) reflect changing perspectives and the complexity of Deaf-Hearing interactions. How does one translate time? 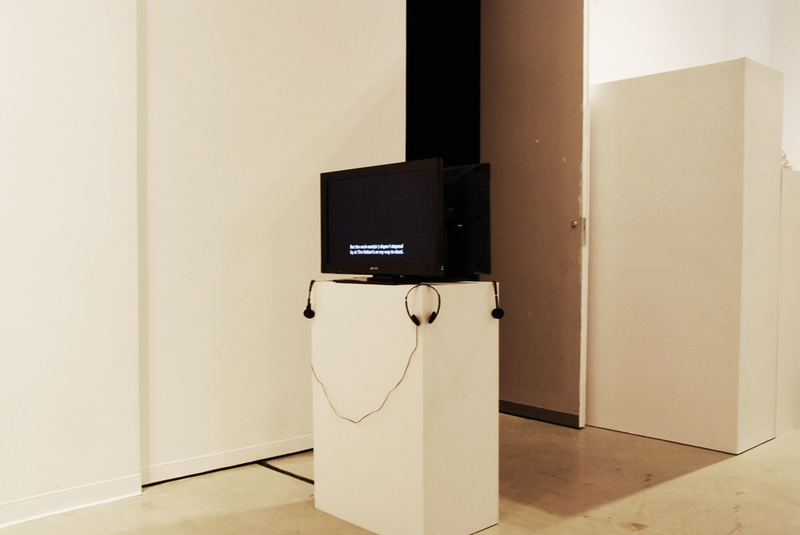 The video piece utilizes a home-video footage taken by Kim's father around 1990 on 8mm tape. More than 20 years later, Kim rips the video from an old VHS tape and re-contextualizes her childhood while playing both of her parent's role interacting and posing questions to her childhood self. Cymatics has shaped our understanding of physic. In my video, the representation of animals' different hearing abilities, is represented by each increment of frequency, alerting us to unnoticed, alternate, organic and delicate modes of communication other than speaking a language or utilizing the internet. This mode is translated to our physical understanding of it: light and visual texture - making the invisible visible, and hopefully, more appreciated. The video is based on the volume & popularity of cymatics videos uploaded onto Youtube over the past few years. The intention of the videos is to display what sound waves look like to the viewer, where sand is vibrated on a speaker to do so. The granules then take form (create patterns) according to the frequency of sound that is played through the speaker. I used this technique to display the lowest frequency hearing range (10Hz to 100Hz) of various animals. I placed water within a dish over a sub-woofer and allowed the vibrations to transition 10Hz - 100Hz, then 100Hz - 10Hz. An interview of a bilingual psychology student about having a double nationality- Bits are translated randomly to both English and Spanish while other texts are telling the viewer to focus and to be present. A video converted to another file type. Some data is lost in the process and the result is a glitchy video. This video explores the imperfection of communication. How language and data can, literally, be lost in translation by either human mistake or will, or by a technological dysfunction. The simple task of communicating gets disrupted by the constant failure to translate the interview/video and by the spectator's mindset. 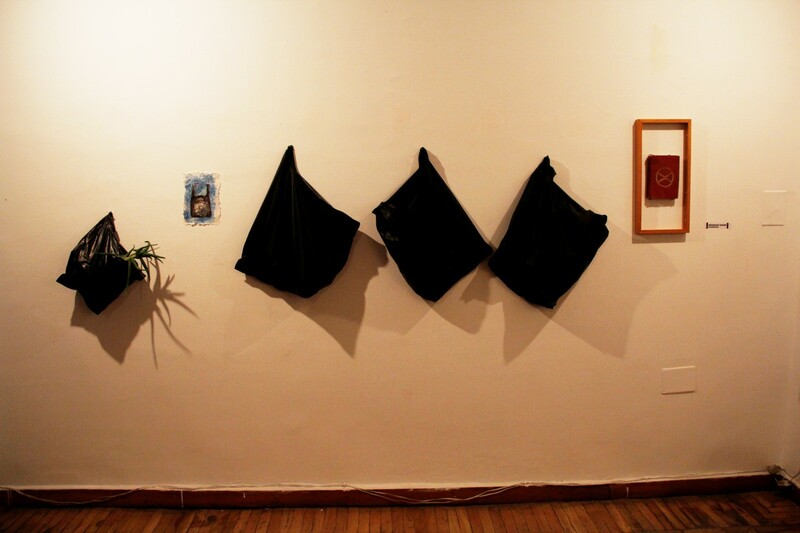 This work deals with attempts of intimacy and working toward togetherness through language mimicry. In this video a man sits on the edge of a bed with myself on his left. He explains in Portuguese how our relationship began over a year ago. He speaks sentence by sentence, as I mimic the words he is saying, more often than not, repeating incorrectly. Although the relationship between Portuguese and English is complex and complicated within this video, it is not to say that it is not productive. Our differences do not translate into opposition. 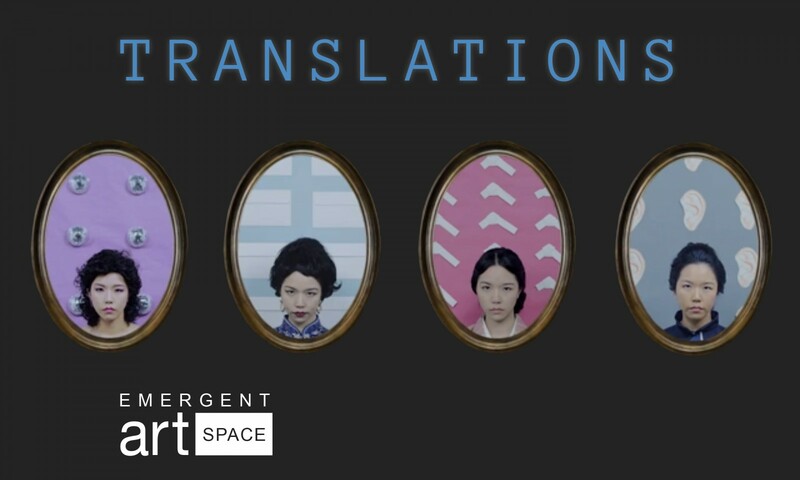 Our exchange holds value as an intersection for two to work towards ‘togetherness.’ The video utilizes the difficulties in cross lingual communication as a metaphor for the productive mistranslations that occur in intimate relationships between two people. 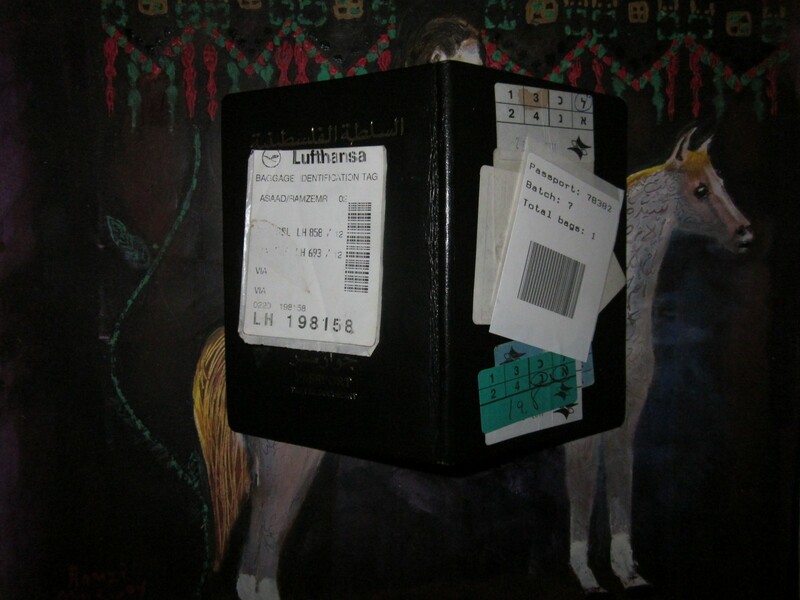 Recipe and Receipt/Lecipte and Leceipt is a humourous two-part video installation. Part 1, narrated by GunHo Bae, a non-native English speaker, loops for 4 minutes and 5 seconds. Facing directly opposite its screen plays Part 2- Leceipt and Lecipe, which is narrated by Jared McAdam, a native Canadian English speaker. Both speakers relate a personal narrative describing the frustration of being misunderstood. I have reinforced this sensation with the use of subtitles: Part 1 contains phonetic transcriptions, while Part 2 provides grammatically correct versions of the same discourse. Although not immediately apparent, the script for Part 2 appears in Part 1, and vice versa. Inverting the ‘correct’ forms of language questions the authority of a native English speaker. This requires the viewer/listener to pay attention to both what is heard and what is written. Learning the difference between pronouncing the word receipt and recipe in a Tim Horton’s is an invitation to the common experience of misinterpretation. In a famous Saint-Petersburg prison called "Kresty" ("Krosses") there are some cells with the windows face Neva embankment. Prisoners of these cells invented special language to communicate with the people outside. One can often see some people standing on the road and writing letters in the air, which (if you have a skill) can be readen. So, prisoners can receive letters without passing censorship. As a rule, people who write these letters are women and their texts are very intimate. In general, in relationships between people especially between man and woman, there is a special language which is not apprehensible to outliers. One should have an experience and concentration on message to get its point. And writer have to put much effort to create a message. Sometimes only with mental and physical strain one can convey the notion to another person. Through the physical pain mental torment get more clear realization. Visual simplicity allow to concentrate on the text of the "letter". Erick Msumanje is a Tanzanian-born experimental filmmaker. He received his BA degree at Hampshire College and is currently pursuing his MFA in visual arts at UC San Diego. As a filmmaker, his work primarily focuses on re-imagining the African continent, by creating stories that explore the African experience and condition in the past and present. "In the night" is made up of two short video art pieces that explore traumatic experiences. My work is informed by my interest in psychology and concepts related to our existence, subjectivity and consciousness. I try to search for a representation of self-identity that describes the character of appearances and their relationship to place. In addition, my work attempts to explore visual strategies that suggest an implicit relationship within the soul that is affected by public space. Moreover, I attempt to reveal the source of characteristics that are buried and never declared except in our own subconscious; but which inevitably affects the way in which we capture and interpret images. Freud defines “awareness”, as a voluntary act that occurs in complete mental awareness, unlike behaviors that occurs in the time of lethargy and omissions. Taiwan’s fragmented political identity and changing of language and culture is the main focus of the project. In this video, I perform each the four female characters. They are all from the region I was born in, but born different historical periods. Taiwan’s political identity has been in constant flux. Making this project has been for me an important discovery process in knowing where I am from, more exactly who I am or who I think I am. "Are you part of a clan or tribe?" V.I.S.A. is a work made to instill into the viewer an uncomfortable mixture of both mindful repetition and tiresome scrutiny. It confronts him/her with the set of protocolary questions all United States of America’s embassies and consulates ask to anyone applying for a Visa. A rite of international passage for which matters like proficiency in Israeli martial arts, history of presidential assassinations and human tissue trafficking are a big ‘no,no’. In the end, Various Implications, Solid Appraisals is about acknowledging these important matters not to a flag/nation, nor to a mother/father, but to something much less forgiving: one’s heart. It is advised to revisit V.I.S.A. regularly: if not for the peace of mind it offers, at least for the automated response it ensues. Star Spangz is an experimental video that involves a translation and deconstruction of the US national anthem, using my own performativity and musicality to think through the diasporic condition, US-Liberia aesthetic and historical connections, and the notion of belonging. This video explores the way identity is constructed, navigated, felt and molded through a poetic approach. This video poem starts with an event that evokes the narrator's memories about the times before the disintegration of Yugoslavia and encourages reflection about what war actually brings and how quickly people forget. The poem can be interpreted as a letter or a confession of an unknown man written for former Yugoslavian president Josip Broz Tito's ship, Galeb, and/or for his wife Jovanka. The ship has symbolic value through the variety of short scenes we can observe interpretations and connections between real life and the imaginary world of poetry. The video was exhibited on Tito’s ship in Jovanka’s bedroom. The visitors could climb in her bed and have an intimate moment with the video and the nostalgia present in every corner of the mighty old ship. Harmony. White balance. Two. No anger. Black balance. Three. Position without contradictions. Gray. Four. Silence. Physical examination. Five. Moment. Purely theoretical. Six. Quartz screen. Somatically. Seven. Standard Model. Concept. Eight. Different connotations. Commonly. Nine. Hold still. Count. Ten. In my work I examine the processes taking place in our daily lives, which are a representation of relations between our external and internal worlds. I collect information about the internal aspects of the human psyche from the imprinted contents of experience, which activate the conscious and unconscious content and schemes of a human functioning. Disease and its metaphors preoccupy the most part of my considerations. I analyze the level of health illiteracy, paying attention to its social causes and consequences. I consumed significant amount of drugs during the disease, and underwent two experimental therapy, constantly receiving wrong diagnosis. I like to touch viewers with my works, the most recent realizations lays on the ground, and are described with a legend in the form of neon. The dyes used in works, I'm obtaining from drugs and chemical reagents used in medical laboratories. This performance focuses on women and the pendulum shift of power that is reimagined from the past of 1956 to the present day struggles and victories women in South Africa endure. Paying homage to the existence of women both past and present I create a character in the guise of my great grandmother. The boundaries that still restrict women are a reality in present day South African as well as across the world. I reflect upon this using the grids on the blanket I wear and assert my gender bare breasted in Langa Freedom Square. I presented my self with questions in conceptualising my performance for Youth Day. I have no recollection of the years of apartheid but I was born just before South Africa became a democracy. Sarafina (movie) was thus a source of reference of these issues growing up. I witnessed the youth's zeal to fight for a better life and break rules for a better education. I performed this persona at Walter Sisulu Square (Kliptown) where the Freedom Charter of 1955 echoed the same ideals that the youth of 1976 fought for.